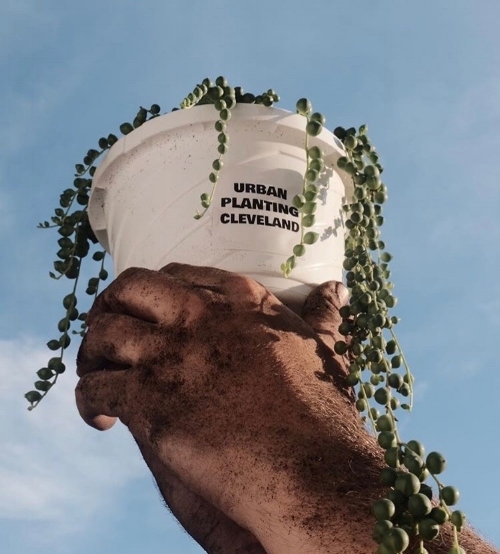 The first time that I heard about Urban Planting Cleveland was at the Hessler Street Fair on Cleveland’s East Side. I was immediately drawn to their tent because of their framed moss pieces, but I soon wanted to take home their entire collection. Of course, it helped that Elio’s parents, who were manning the booth, were absolutely delightful humans. They spoke so highly of their son and his small business that I could not help but to support the cause—plus, the plant art was simply to-die-for. After hanging my moss frame, I tagged Urban Planting Cleveland in a picture and posted it to Instagram. Within a few hours, Elio had responded, personally thanking me for my purchase and support. From that moment on, a virtual friendship was born. So, when it came time to finally meet for the first time, I was excited to get to know the man behind the plants. During our conversation, I learned that I was one of the first to tag Elio’s pieces and, after quite a few months, he was still ecstatic about it. When we first set up our face-to-face meeting, I told Elio that it shouldn’t go longer than an hour or so. Rather, we got lost in conversation and sat sipping margaritas for well over two hours. Elio is a laid-back, easy-going guy with a grounded outlook on life. Through our conversation, it was evident that he has an encouraging support system of friends and family, whom he relies on heavily to keep him going. Elio Calabrese grew up in the suburbs on the westside of Cleveland. After graduating from high school in 2009, Elio ventured to the University of Cincinnati for college where he majored in Communications and Public Relations. He loved his major up until senior year, when digital media started to play a major role in the curriculum. He remembers seeing the shift from learning about traditional public relations to utilizing social media for ad campaigns. This shift caused Elio to feel uncomfortable in the education he had once loved. Elio admits that he doesn’t like feeling intertwined in other people’s personal lives. When using social media for personal use, he would catch himself knowing entirely too many facts about people that he never made the effort to talk to in real life. This made him feel uncomfortable and got him thinking about what other people were saying about him. In fact, he deleted his Facebook almost 10 years ago for that reason. But, in April 2018, for business purposes only, Elio decided to give social media another shot. While Elio’s business is young, his love for plants dates back to his college days. His roommates at the time were starting to get into the art of keeping plants and Elio decided to take an elective horticulture class to learn more about them. But, to his disappointment, the class became all about cells and plant biology and less about garden cultivation; By the end of the semester he had little inspiration to take away. Thankfully, he had his neighbor Julia to pull him back into his soon-to-be-passion. Once Elio graduated and left Cincinnati, he returned home to begin his career search and worked at a restaurant in the meantime. However, as he started to look for jobs, it soon became evident to him that he would not enjoy working in the field of public relations. After a year-long search, Elio landed a job at a small, locally owned company in the plant industry This lead him to going to multiple plant shows and exhibitions through the year where he has gained helpful insight from various small business owners. While he was launching his career and becoming more comfortable in the field, Elio started buying creative plant items and playing around with his artistic side. But, when these items lost their thrill, Elio began creating less and less. Eventually, they found a spot tucked away on storage shelves and Elio ignored his creative drive, with the active thought that there was no way he could start a business surrounding creative horticulture. That is until one day, he woke up and, without explanation, decided to just go for it. In late 2017, Elio launched Urban Planting Cleveland but had no concept of how difficult it would be to thrive as a small business owner. Yet, he was fortunate enough to have local artist Chris Deighan on his side. Chris took Elio under his wing and immediately taught him everything there is to know about building and running a successful company. Yet, with all of Chris’s help, Elio continued to learn so much on his own. He laughed while reminiscing about maintaining his tent through inclement weather during one of his first events. Aside from learning the basics of event participation, Elio has continued to discover how to appeal to his audience. He’s had to come to an understanding that part of that process involves learning that something that he may be obsessed with as a business owner may not be as popular with his customers. Elio is lucky that he has such a strong support system to keep him going when creating gets tough. Take his friend Wayne, for example. Elio met Wayne at one of the first events he ever brought his business to and they have since become unlikely best friends. Wayne is a retired, older gentleman but his positivity and charm keeps Elio going, even on the toughest days. Like Wayne, it’s people in general that keep Elio focused on the positive sides of business. Earlier this year, after participating in an event that went horribly wrong, he met a stranger that turned around his whole day around. A man approached Elio at his tent and told him that he had a huge plant at his house and asked him if he would want it. Oddly enough, Elio admits that situations like this happen to him at almost every event that he goes to but he usually passes up the offer and never hears from the person again. On this particular day, however, he decided to follow through with the opportunity. With the momentum of his first summer event season coming to a close, Elio is excited to focus his selfcare while dreaming up ways to continue to expand his business and give back to the community. When it comes to maintaining a work/life balance, Elio has his fiancé Liz to thank for keeping him grounded and afloat. She has taken it upon herself to become completely involved in all of the behind-the-scenes aspects of Urban Planting Cleveland and has helped Elio evolve his business into what it is today. Elio knows that continuing to expand this business is what he is going to do; It’s what he wants to do. But, just like he felt when he had the idea to start this business, he is trying to get to the point where he is ready to take another leap of faith. He is consciously working on ridding his mind of all negative thoughts in order to push himself forward in life and in his business. Elio’s advice to you? The same advice he is currently giving himself.